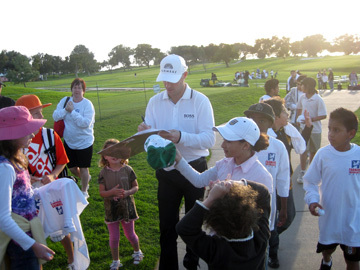 Ben Crane signs autographs for kids after giving a golf clinic. Ben Crane, defending champion of the Farmers Insurance Open, was seemingly everywhere Tuesday at Torrey Pines. Crane joined many of his peers in the morning on the driving range, then he stroked a few putts on the practice green before heading out at noon for a few practice holes on the South Course. Later, Crane made his way to the media tent to answer a few questions, like: How challenging is it trying to repeat as tournament champion? “I’m not really expecting a lot this week,” said Crane. “What are the chances that someone actually defends their title when they’re not Tiger Woods? It doesn’t happen very often. After that gathering, it was off to another one with an audience full of questions. On the No. 4 hole of the North Course Crane hosted a golf clinic for more than a 100 youngsters. He passed on pointers to the kids, awed them with a few trick shots and afterwards autographed everything and anything they offered for his signature (as talented as these players are at hitting a golf ball, it’s even more impressive that they can sign legibly on something round with dimples). As big a presence as Crane has been at Torrey since winning — his picture is plastered on the program and on signage throughout the venue — kids have a way of keeping one grounded. Jaden, like the other children, came away with a Farmers Insurance hat and T-shirt as well as a golf ball. And perhaps something else that he may not realize for a few years. This entry was posted in Family Vacations, Golf & Sports, Insider Tips, San Diego Events and tagged Ben Crane, farmers insurance open, golf, north county, Torrey Pines by Kirk. Bookmark the permalink.